Charlie's hit the road again. No idea where he might be. No idea why he might be there. Really, no logical ideas about this at all. Was it the possibility of capturing a distant line of perspective off in the horizon that made the photographer think all these parallel lines led somewhere? Was it the flat top hill in the background? Or was it simply that Charlie looked nice framed by a bush and a dumpster? "Charlie, move a little more to your right. No, your right. Keep moving. A little more. Wait! Stop! That's perfect. Now I can see the dumpster." Charlie is alone. So very alone. Standing on a lonely wet road next to a dumpster, but not too close to the dumpster. The dark clouds look ominous. Stay away from the dumpster Charlie. Stay away! I think you're lucky you can't see the rest of the view. There's probably less to see there than here. Yes, I'm guessing just Charlie being there was the point. It's Charlie and he's there. Why should we ask for more? 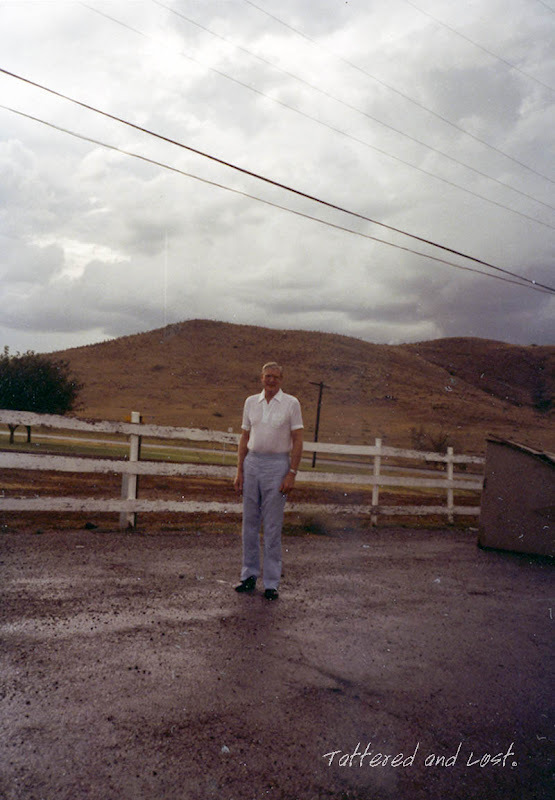 It's funny some of these photos make me wonder if they are places from his past, and if there might have been a series of several photos at the same location, but a bit different view? Of course back then folks couldn't snap as many photos as they do now, so maybe this is the only shot out here. But really and truly why would they have included this dumpster here? He's still smiling anyway! Indeed it seems we can count on the cheerfulness of Charlie no matter how obscure the location.